Residents of Posočje are accustomed to alternating national flags, being at a windswept location at the crossroads of major empires and Slavic, Latin and Germanic worlds. When visiting the Kluže fortress at the door to the Soča valley you can relive fateful moments from World War I with the help of enthusiasts of Society 1313. With this you can get to know how radically history has repeatedly toyed with this beautiful alpine valley. The famous novel by Ernest Hemingway ‘A Farewell to Arms’ is set in Soča Valley. The writer thoroughly describes the Soča Valley and offers insight into these ground-breaking historical times. This year is the 100th anniversary of the start of World War 1 and in almost every corner of the Soča Valley you will find memories of this event. Caves, trenches, ossuaries and cemeteries remind us of one of the biggest mountains of conflict in human history. Key scenes are connected by path of peace, a unique project in that it promotes a positive view and peace in the war. At the same time it is also the best guide through experientially one of Europe’s most beautiful alpine valleys. The path that winds from the Alps to the Adriatic along the Soča River connects the natural beauty of the alpine, subalpine and karst world in addition to the heritage of the Soča Front, all of which has mountains, cultural monuments, museums with private collections, tourist-information centres and many tourism suppliers. It makes this valley also very attractive for conference guests. Bovec, Kobarid and Tolmin – are connected by the Soča river, one of the most pristine Alpine rivers that, with its beauty, creates a highly experiential diversity. Soča river is perfect for postcards and adrenaline water sports. The roots of rafting and kayaking in the 1980s were a revolution and considered to be one of the first organised forms of teambuilding in Slovenia and the wider region. The destination is safe, enjoyable and full of inspiration for congress participants. Despite its remoteness the communal infrastructure in the three major towns is very well arranged. Access to the Soča Valley is good, despite the relatively poor local road connections, as in the immediate vicinity there are of the four airports: Ronchi (Aeroporto Trieste), Venice (Aeroporto Marco Polo) Ljubljana (Airport Brnik) and the airport in Klagenfurt (Klagenfurt Airport). There is also a more romantic way to get to the Soča Valley – the museum train to Most na Soči. A railway was built through Baška ravine, which due to its attractions – tunnels, bridges, views – is increasingly popular with tourists. A special attraction is the museum train (steam composition), but the car-train connection to Bohinj and Bled is most comfortable. Soča Valley has for many years been attracting guests interested in active holidays and adrenaline challenges. At the same time they are seeking peace and contact with nature through other sport on Soča, such as fishing and hiking, as well as exploring the rich history. Emphasis has been for many years on the summer season, although the incentive offer is also quite rich in winter. Fortunately the destination is not too populated and offers a special feeling of exclusivity, which in the more notorious places is hard to find. Bovec (483 m) is the largest tourist centre in the Soča valley. It has the most tourist facilities in the area and is recognised primarily as a centre of sporting activities in nature. Kayaking, rafting, hydrospeed, canyoning, paragliding, rock climbing and hiking, mountain biking, sledding, cross country skiing, etc. is all on offer by more than 15 specialised sports agencies. Sits under the mighty Krn mountain (2,244 m) and has in its surroundings Breginj, Livško, and Trnovsko gorge – the centre of rafting and kayaking exploits – as well as the beautiful mountain villages under Krn (Drežnica, Vrsno, Krn). The greatest impression made on Kobarid is by the first World War. The narrative of the history of the place and especially on the Soča front can be taken in at the Kobarid Museum, the best museum of Europe in 1993. Kobarid is also the Slovenian town that can boast the highest number of excellent restaurants in one spot. Even for the most pampered lovers of good food and fine wines a visit to Kobarid will be a great experience. Is the largest settlement and administrative centre of the Soča valley. To the Tolmin municipality belong Tolmin and Most na Soči with the surrounding areas of Baška ravine, Šentviška plateau, the edge of the Idrijca valley and the mysterious and thinly populated area of Trebuše. Tolminska offers great opportunities for active incentive programmes. Numerous forest roads and trails offer excellent conditions for mountain biking. Fishing is the most popular tourist activity in the area, as the rivers Soča, Tolminka, Idrijca and Bača are full of trout and grayling and offer a superb diversity of natural environments that attracts many anglers from around the world. The congress story relies on a responsible and unforgettable connection to the nature and culture of the region. It is therefore a boutique congress tourism, with no large hotel resorts. Perhaps Soča Valley, because of its remoteness, comes closest to responsible green tourism. There are a number of programmes that provide unforgettable green congress experiences in the middle of the Triglav National Park. In Bovec there are a number of sites that are potentially interesting and allow the preparation of interesting incentive programmes, although they are limited in terms of capacity, for example the Kekec Homestead, Pristava Lepena and Dobra Vila ecological tourist farms, as well as in the House of Franko and Nebesa (Heaven) in Kobarid. The main classic congress infrastructure is otherwise currently available in a smaller conference centre, Šiglič house in the centre of Bovec. The multi-purpose centre is very nicely renovated and can accommodate up to 100 conference delegates. The main hotel and meetings supplier at this moment in Bovec is Hotel Alp, which operates during the summer season. Suitable conference halls in Bovec can also be found in Mangrt hotel and boutique Dobra Vila, as well as in pension Boka. The largest hotel in the valley, the Hotel Kanin that has congress facilities and a considerable number of rooms, is currently closed and waiting on a restart. In Kobarid smaller meeting rooms are offered by the Hotel Hvala (Thank you). An event can easily be combined with the adjacent spaces in the TIC. In Tolmin the main provider is Hotel Krn. All over the valley there are a number smaller suppliers of apartments and restaurants that accommodate and provide space for smaller congress groups. Currently there is a very fragmented offer that is not adequately linked and presented on the international congress map. Given the enormous potential a functioning convention or incentive bureau would greatly help and would help to improve the image. In addition, the joint offer would also be easier to market to specific types of congress clients. Soča Valley is probably one of the most photogenic venues to launch new cars. Numerous film crews and car launch programme organisers have already understood this. A connected performance would facilitate marketing and access to specific clients, who are currently coming to the Soča Valley more by chance. Metaldays is Slovenian metal music festival that takes place every year in Tolmin. Pure passion, refreshing energy, adrenaline, new name and a fresh start on the most exceptional location. In the idyllic nature of Tolmin at the confluence of the Soča and Tolminka river, Overjam international Reggae festival takes place in August. Sajeta Creative Camp is a festival and a place of encounter for various artistic practices and experiences with music as its central component. There must be something special in the Soča Valley, as films and commercials are constantly being shot there. The photogenic qualities of the valley, however, are not enough; congress products need to be connected into a single story that does not necessarily see municipal boundaries. We positively await their first attempts and with high expectations. Do you want to Experience the joy of sheer freedom? 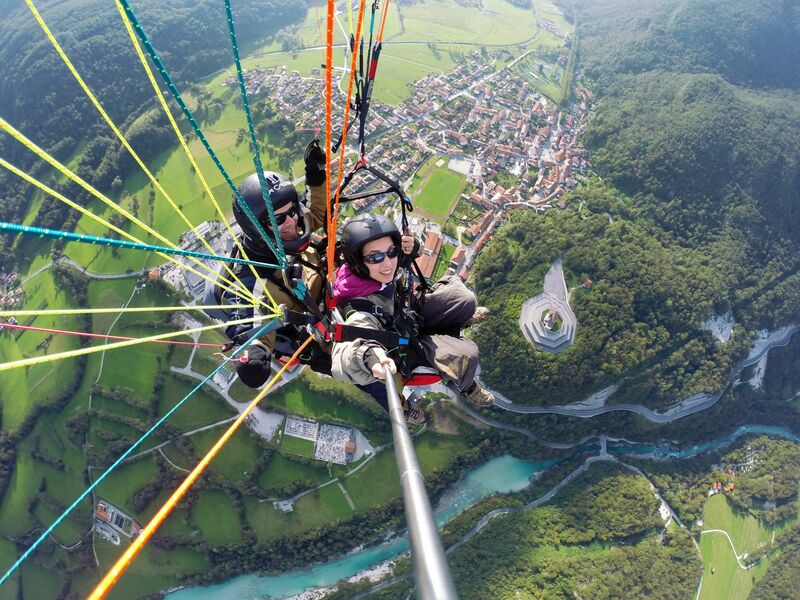 Tandem flights from one of the most beautiful parts of Slovenia are the way to go. For this unique experience you don’t need any preknowledge or special equipment. Only a desire to fly which can later become your passion. Run a few steps and before you know it you’ll be airborne. Admire the beautiful emerald Soča River and the mountains of Julian Alps from the air! ČOMPE – the original dish, based on combining cottage cheese and potato, grows abundantly in the Bovec region.